How I Met Your Mother, Season 6 Episode 11. Just so you know, it’s probably one of my favorite episodes. If you’re in a bad mood, sad, tired or whatever, you should definitely watch it because it is hilarious! ‘The theory states that no matter how much a man is repelled by a “manatee”, as soon as they meet a clock starts ticking until the time when he will eventually find her a lovely “mermaid“‘ (How I Met Your Mother Wiki). If you wanna know how a woman, once mermaid-ified, can go back to being unattractive again… Well… watch the episode!! No spoilers on dontchawannadream. Ahahah I’m still laughing, just thinking about it. Can’t believe the show’s ending soon but… at the same time it’s been 9 years… so it’s probably time to stop. By the way, I told you… 2014 is the year of GLITTER! Ahah I’m having so much fun making these memes/cards. 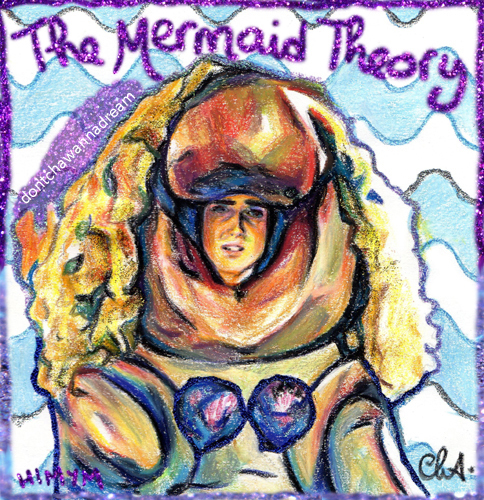 So do you believe in the Mermaid Theory? I do! Perhaps from a distance a manatee might look human-like, but I’m not sure about the beautiful part. I think I’d rather believe in mermaids. And I think this is one of the strangest pictures you’ve done! Oh dear, I can only imagine the scene in the TV show! I like your art though, as per usual!! You should watch the episode, Christy!! Thanks so much. Big hugs!